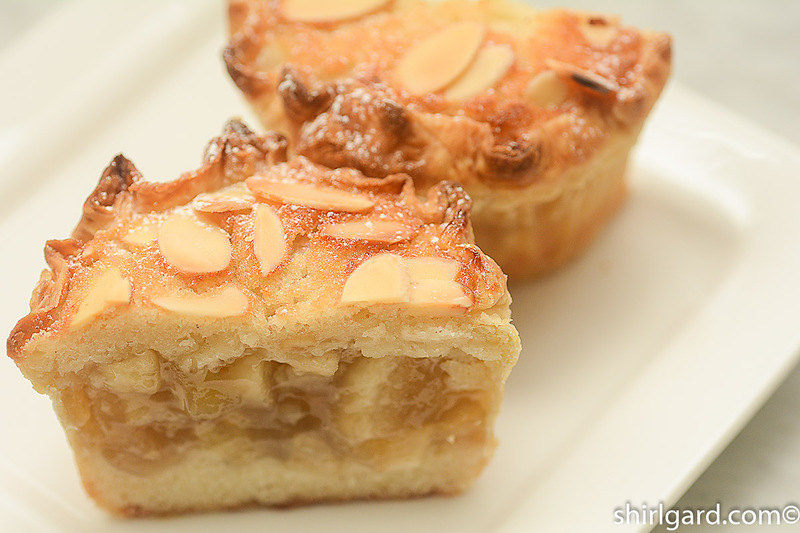 The name “Apple Financier” evokes both “fancy” and “home-y” at the same time. Financiers are classic French petits fours: tasty little almond cakes made with lots of almonds, buerre noisette (browned butter), and egg whites. They get baked in tiny rectangular petits fours-size pans (or molds) that are shaped like little gold bricks. 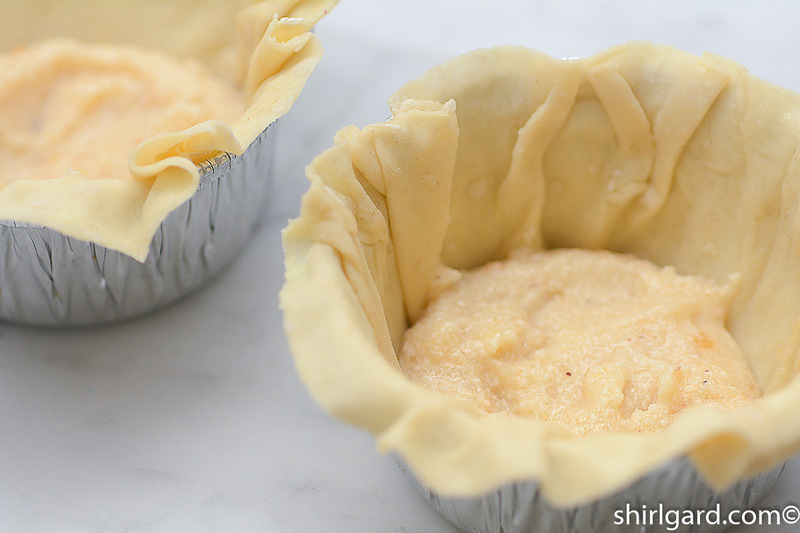 Even though this is the classic size and shape, pastry chefs often bake this batter in every other size and shape imaginable. Financiers supposedly have this name because their ingredients, to some, are on the expensive side. So, when you make Financier batter, think of it as your little indulgence. 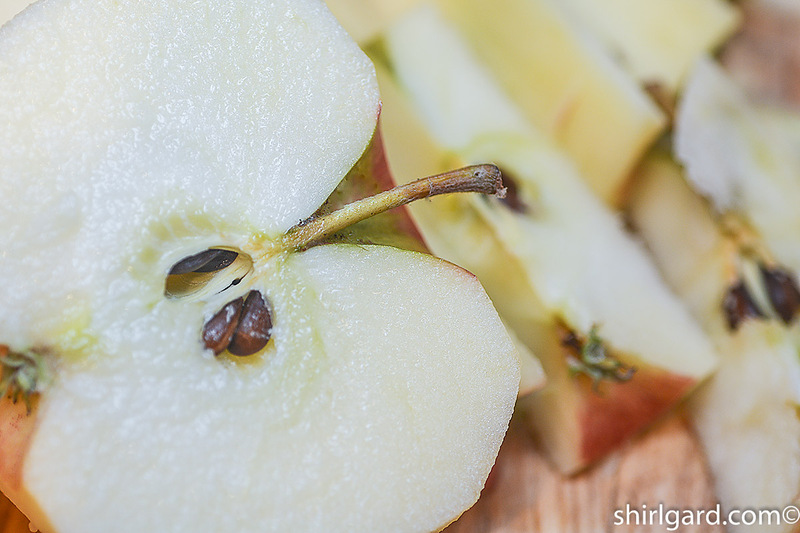 Apples, on the other hand, are very home-y and make you think of grandma’s kitchen with the aromas of cinnamon and spice wafting through the air, or your own kitchen, when there might be a simple “apple-something” baking in the oven for tonight’s dinner. Even when I created desserts as a restaurant pastry chef, I always had “home-y” flavors in my mind. I like “home-y”. Many people eating in expensive restaurants also like “home-y” flavors, because it makes them think of things their grandma used to make. 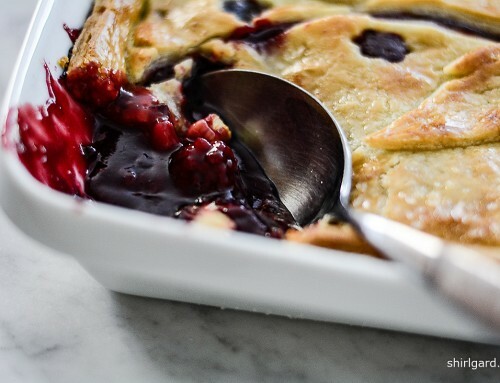 Restaurant desserts, known in the industry as “plated desserts”, tend to have a lot of components so that you can make them look great when they are ordered and plated up for service. The idea is to elicit a “wow!” when the waiter sets one in front of the restaurant guest. The presentation is almost as important as the flavor. This dessert is based on one that was originally created for the chef’s tasting menu at The Old Inn on the Green. A tasting menu dessert is always tiny because it is the last of many courses, so the Apple Financier for that menu was baked in a 2-ounce pan instead of the 4-ounce pan in this recipe. When a new dessert was ready to go on the menu and all components made, I would “plate up” the finished dessert, photograph it, and then create a “Plate Presentation” sheet for the cook who would be plating the dessert that night for dinner service. 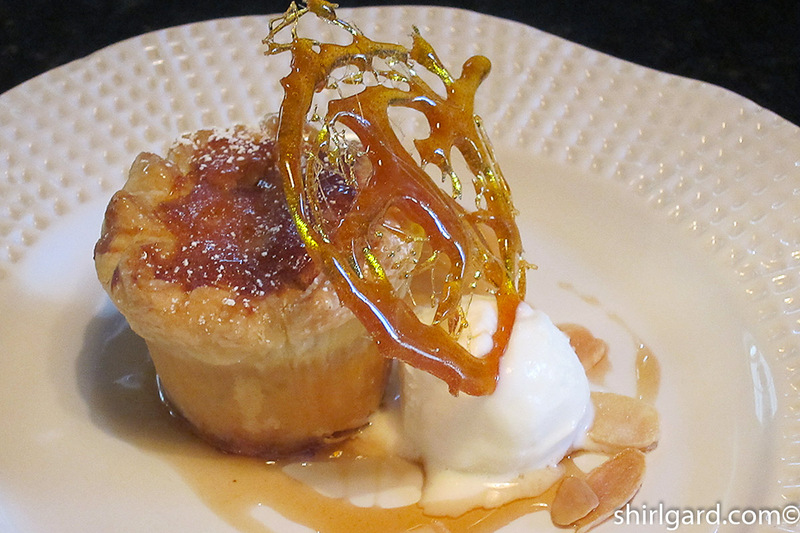 It takes five components to plate this dessert: the baked Apple Financier (made up of three components itself; financier batter, cooked apple filling, and a thin puff pastry shell), Apple Cider Reduction, Fresh Cream Gelato, Candied Almond Slices, and a Spiral Sugar Piece. As plated desserts go, five components is really on the low side; many have a lot more. 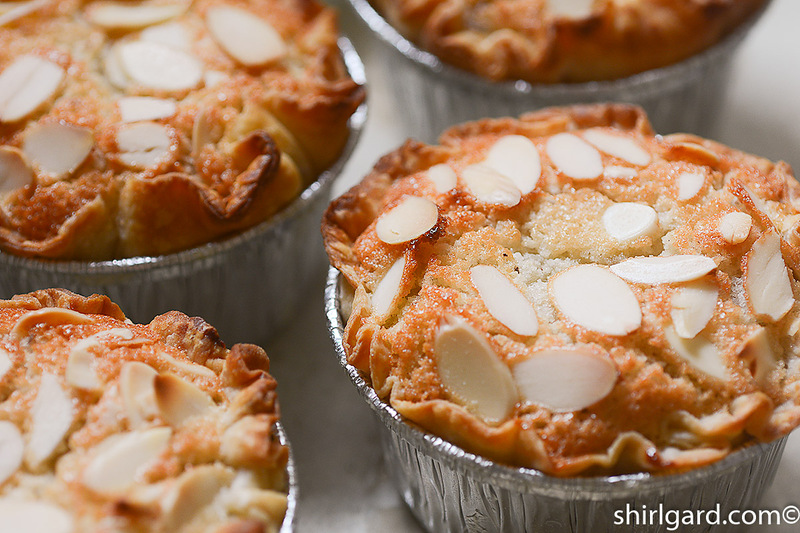 The essence of the flavor in this dessert comes from the financier batter (delicious because of the browned butter and almonds) and the cooked apple filling. 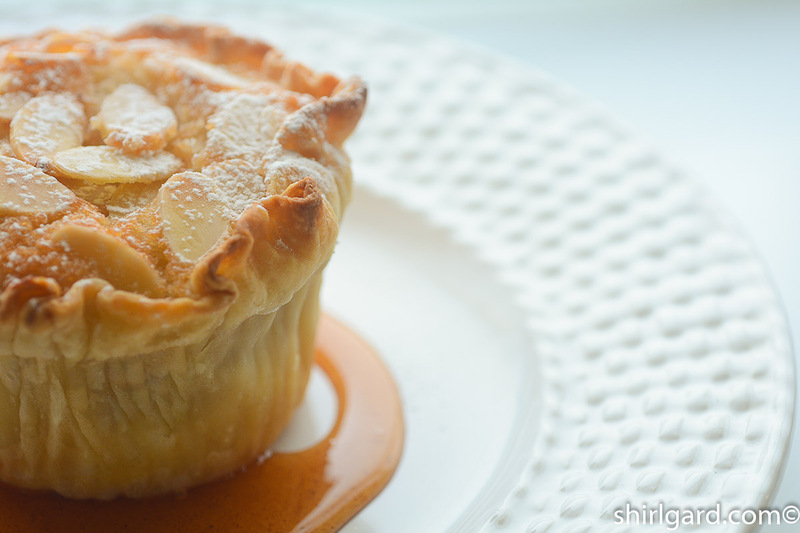 The combination of these two things, nestled in a pan lined with a wisp of thin puff pastry, becomes your warm baked “apple-something”. 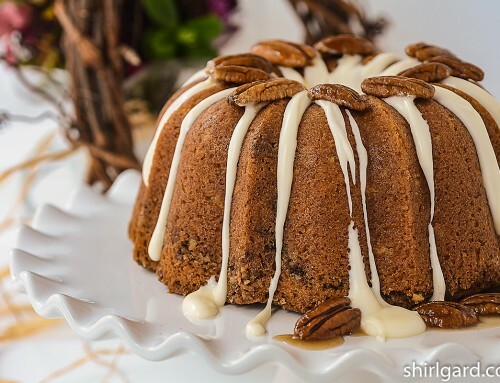 If you want to go a little further, add some store-bought vanilla ice cream, serve it with a little Apple Cider Reduction, or serve it simple with nothing at all. 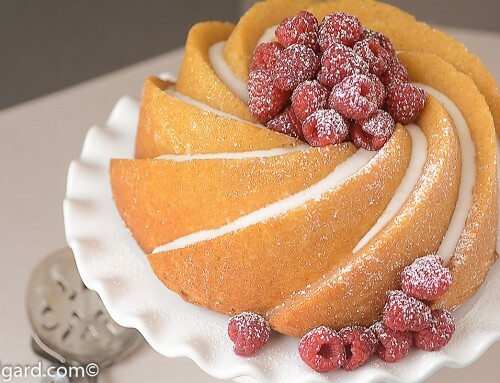 All you really is just is just the little cake to transform Apple Financier from a fancy plated dessert to a home-y one, where jazzy components, like sugar pieces, are unnecessary. I borrowed the concept of combining a financier batter with a cooked apple filling from François Payard’s dessert, “Apple Financier Tart” in Simply Sensational Desserts (1999). 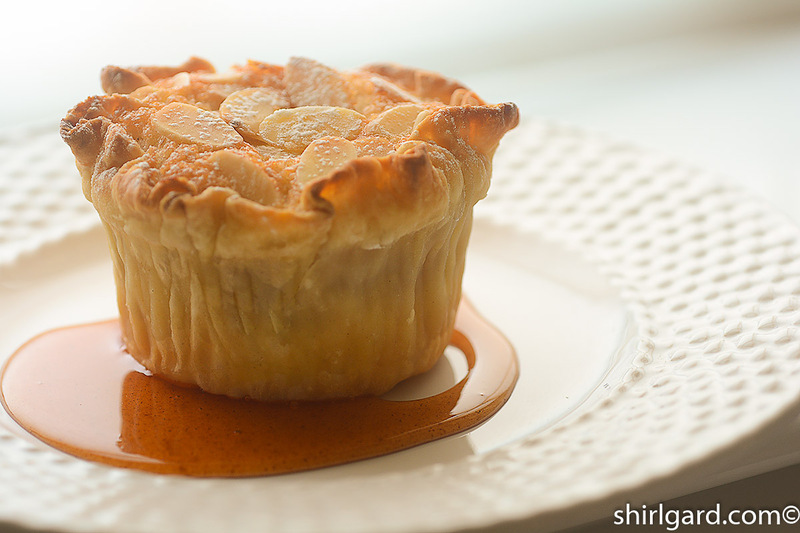 He considers it a “French version of apple pie”. Even though he doesn’t recommend serving it with ice cream, it’s o.k., we won’t tell. 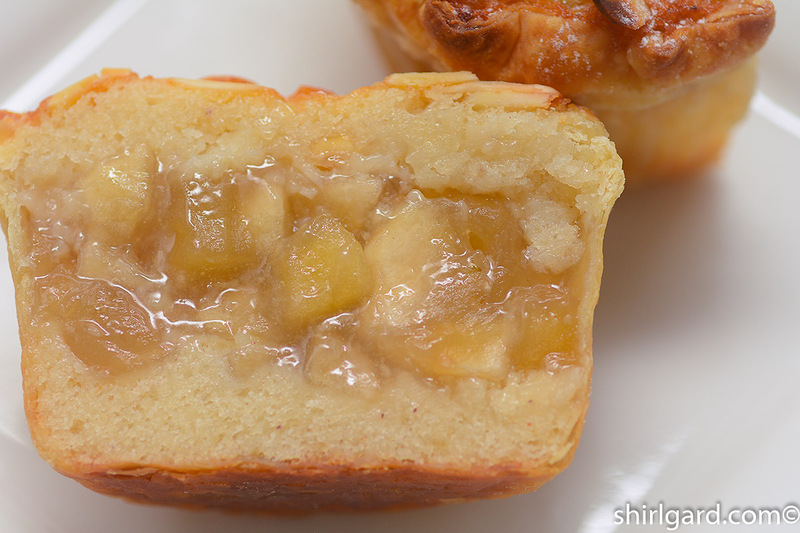 My Chunky Apple Filling was inspired by the “Apple Filling” in Payard’s dessert, but the financier batter recipe, was given to me by Gilles Lavergne, a French pastry chef who I worked with for a few years at Wheatleigh when I first became a pastry chef. 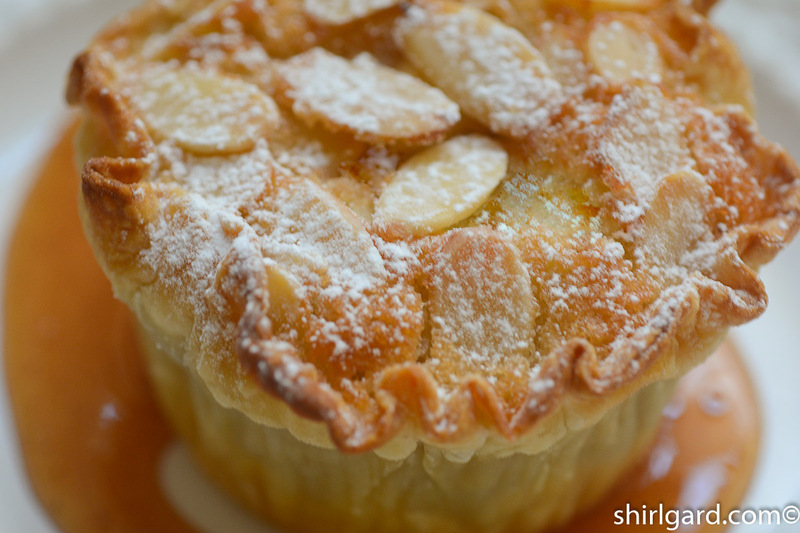 I have used Payard’s “French Apple Pie” flavors to create these little individual Apple Financier Cakes. Pepperidge Farm frozen puff pastry, thawed overnight in refrigerator. One box = 2 sheets. Roll each sheet of puff to an 18″ x 18″ square. 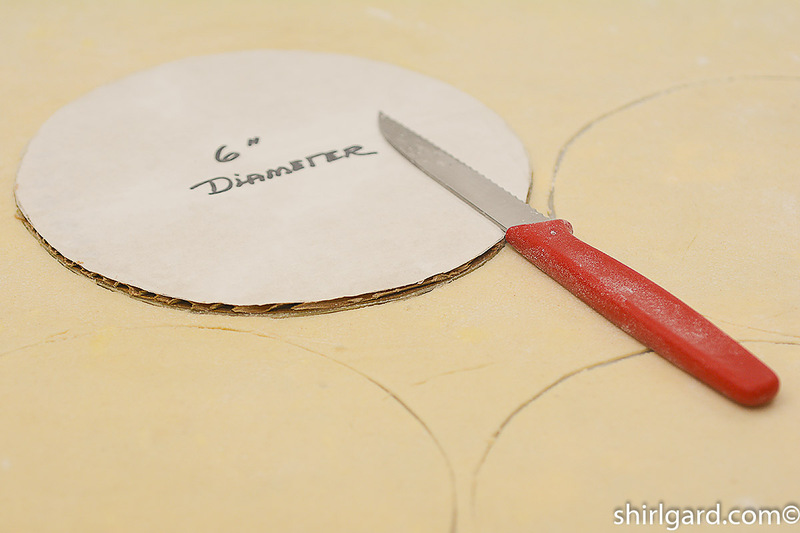 Use either a 6″ diameter cutter or make a template from a cake board. Cut out nine 6″ rounds from each sheet. Total of eighteen 6″ rounds from the two sheets of puff. 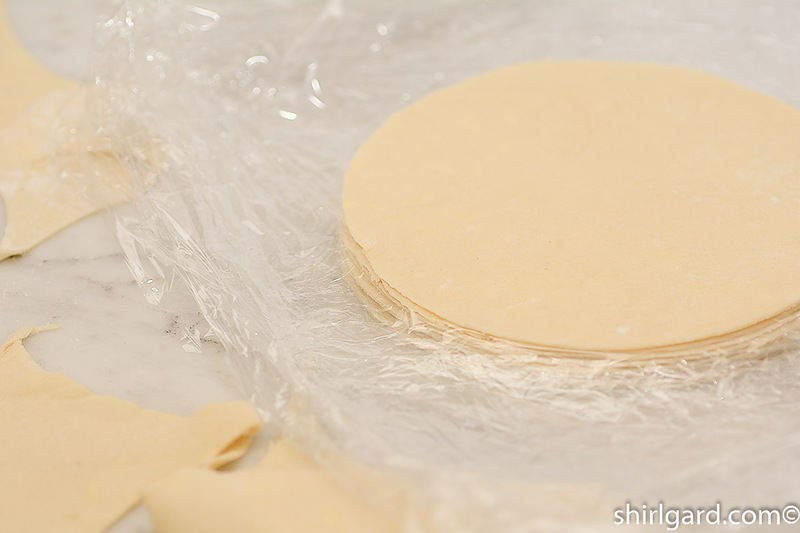 Stack the rounds of dough between sheets of plastic wrap and refrigerate before filling the pans. Or freeze for longer storage. 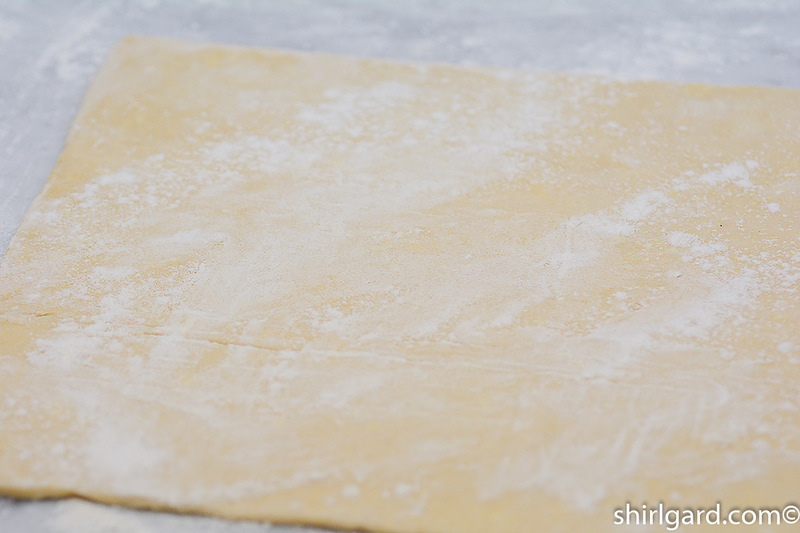 Spread puff pastry scraps on a parchment-lined half sheet pan. 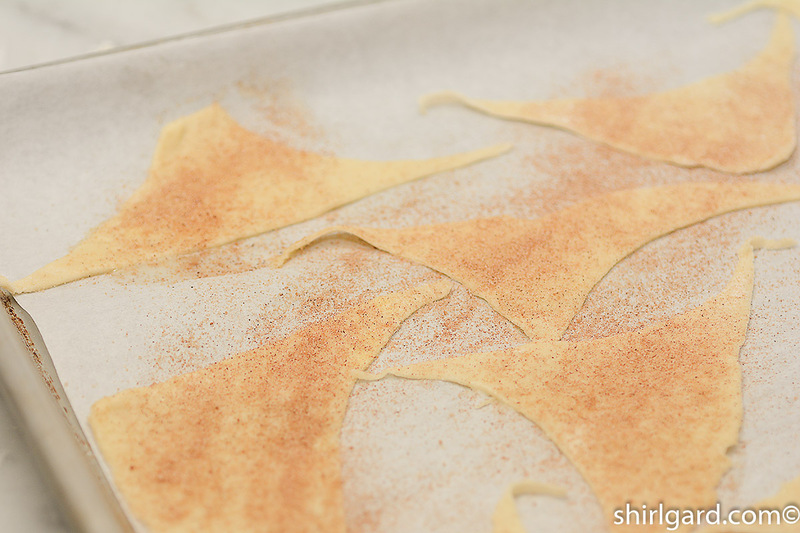 Brush the scraps with melted butter and sprinkle with cinnamon sugar. Bake at 425°F (218°C) until golden brown, about 8 minutes. 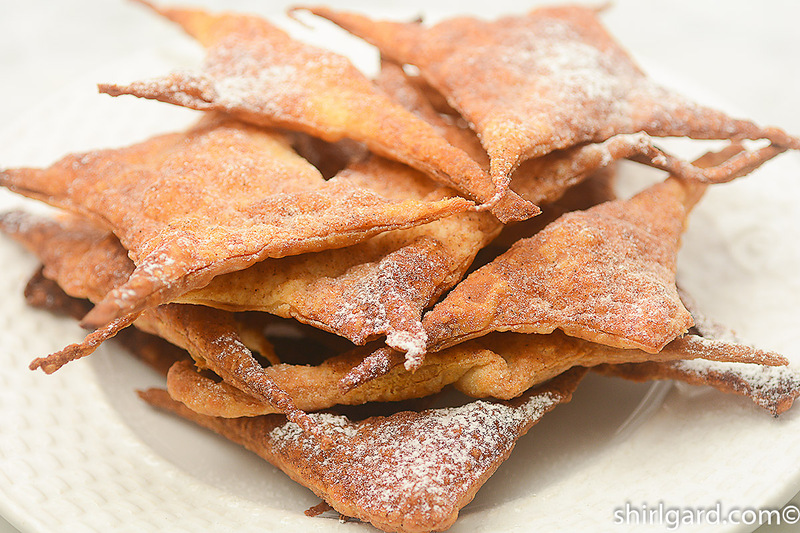 Sprinkle baked and puffed Cinnamon Sugar scraps with powdered sugar. Munch & enjoy! Assembling Apple Financier Cakes Step-by-Step: Two layers of Financier Batter and one layer of Chunky Apple filling per cake. These addictive little cakes come from a recipe that I developed for the chef's tasting menu when I was the pastry chef at The Old Inn On The Green in New Marlborough, MA. 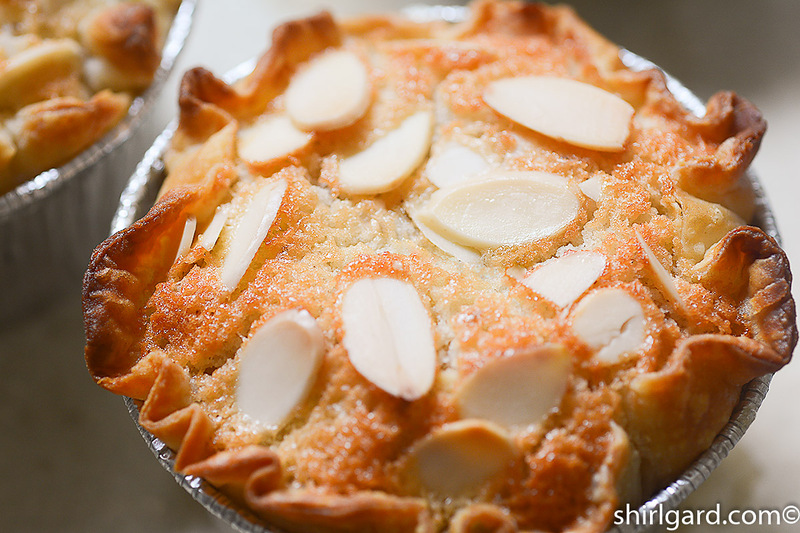 I recommend making the Financier Batter and the Chunky Apple Filling the day before, and if you have time, also roll out the puff pastry and cut out the rounds for the crust. 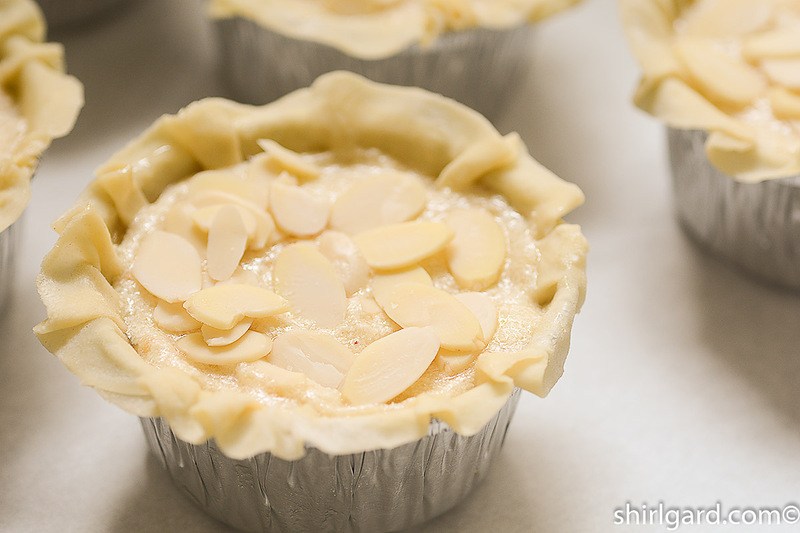 Assembling and baking will go quickly if you've done some of the prep work ahead of time. 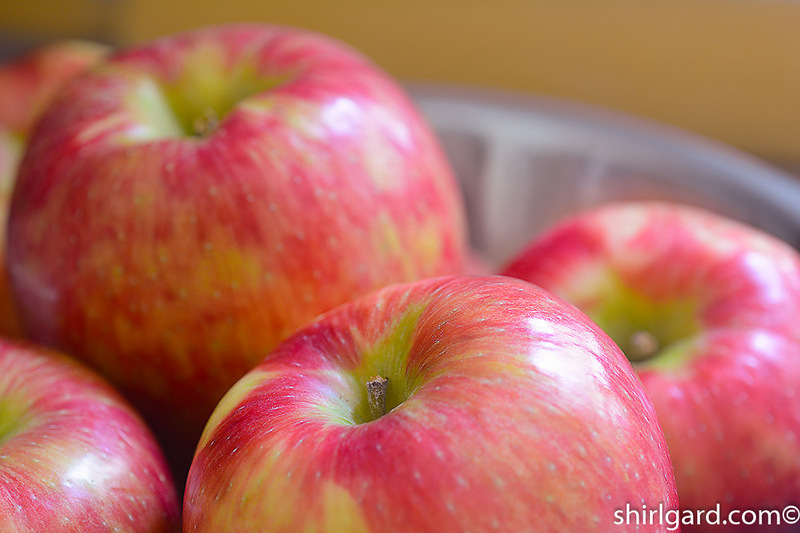 Honeycrisp apples are my favorite apple for this dessert because they are crisp, tart and sweet all at the same time, but they are usually available only in the fall. A good alternative is Granny Smith apples, and because they are available year round, you can make these cakes any time. FOR THE FINANCIER BATTER: PREP BROWNED BUTTER (beurre noisette) FIRST: Cook the 150g (10 tablespoons) butter in a small sauce pan over medium heat for about 10 minutes. 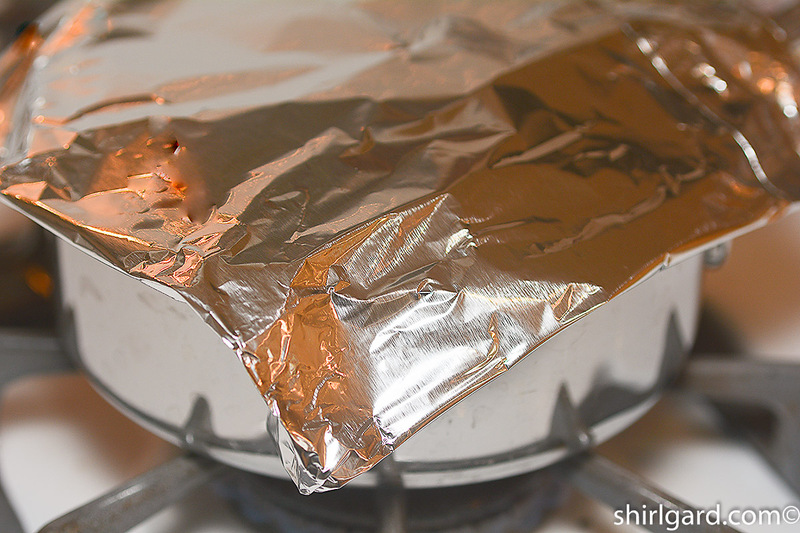 Cover loosely with a folded piece of aluminum foil because the water content of the butter causes it to pop and splatter. 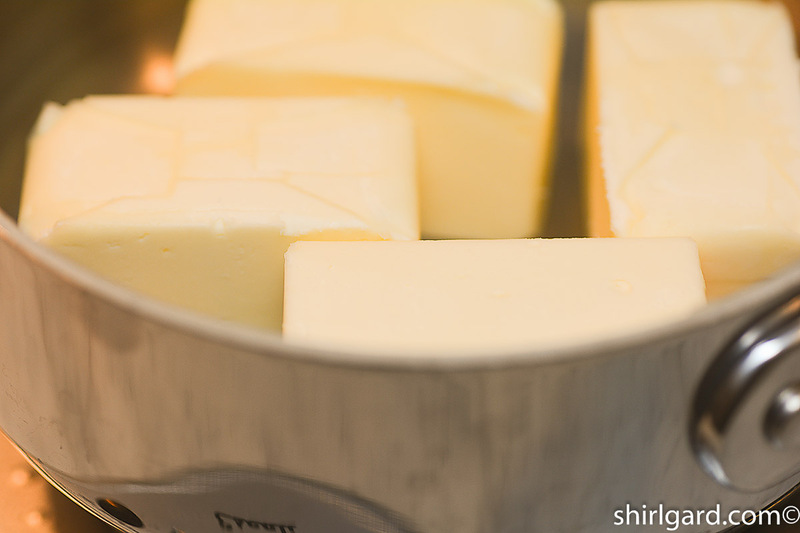 After 5 minutes, the butter will be foaming. Watch closely the second 5 minutes. 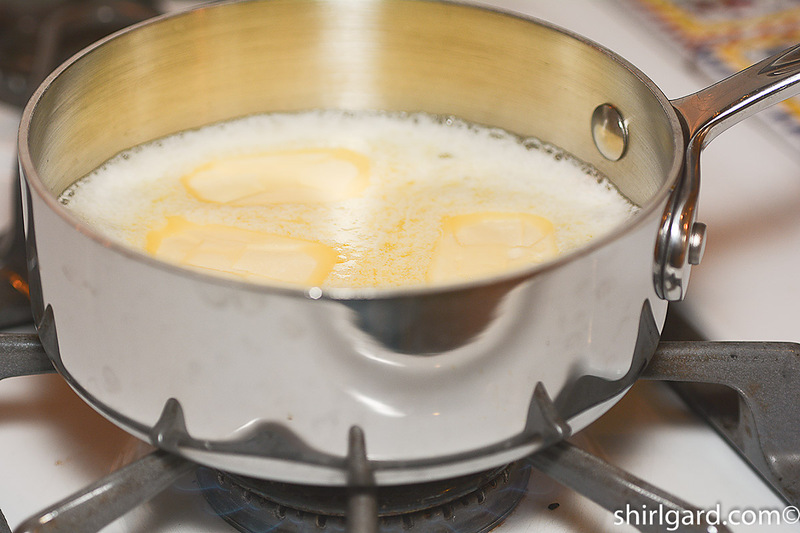 As the butter continues to cook, the milk solids in the butter will brown and drop to the bottom of the pan; the butter will turn a golden brown. 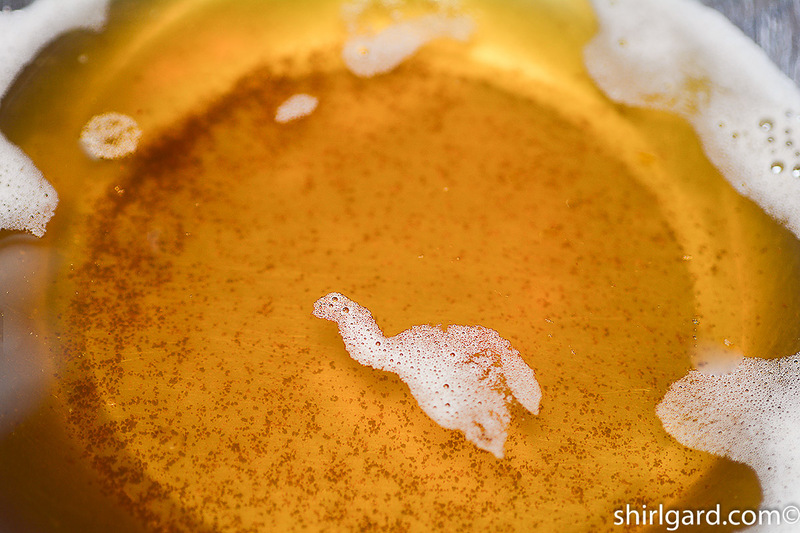 Skimming off the foam will allow you to better see the bottom of the pan. 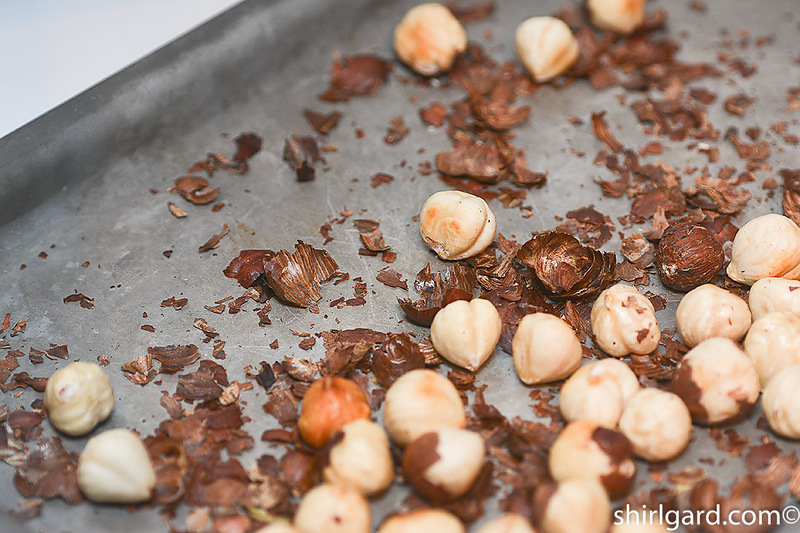 Turn off the heat after about 10 minutes when the solids in the bottom of the pan reach a nut brown. Immediately strain through a fine mesh sieve. 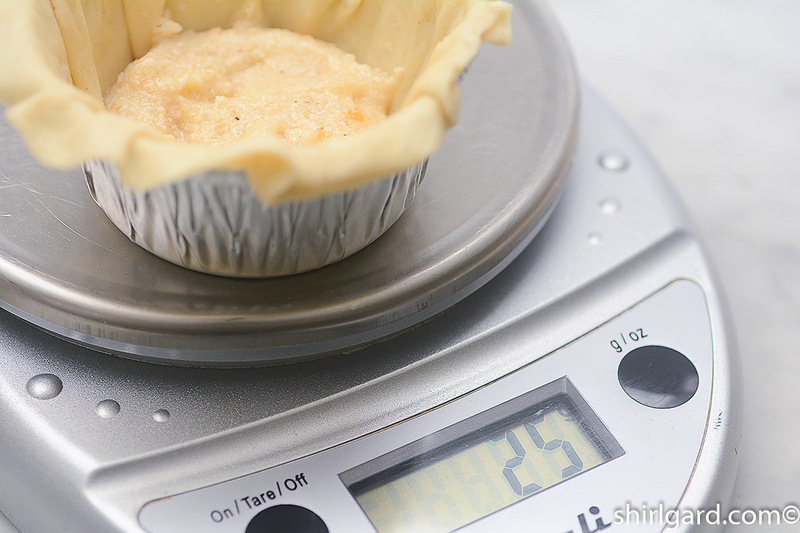 Weigh out the 115g (1/2 cup) needed for the recipe and let cool. 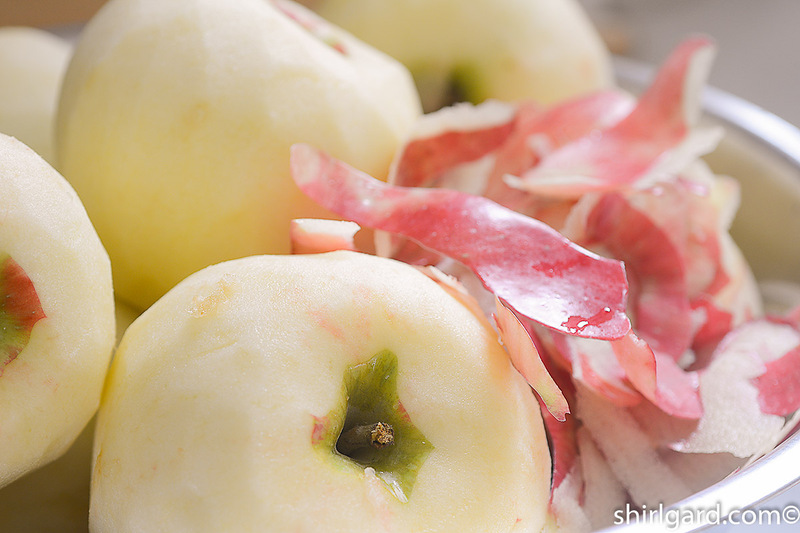 FOR THE CHUNKY APPLE FILLING: TOSS the prepped apples with the honey. 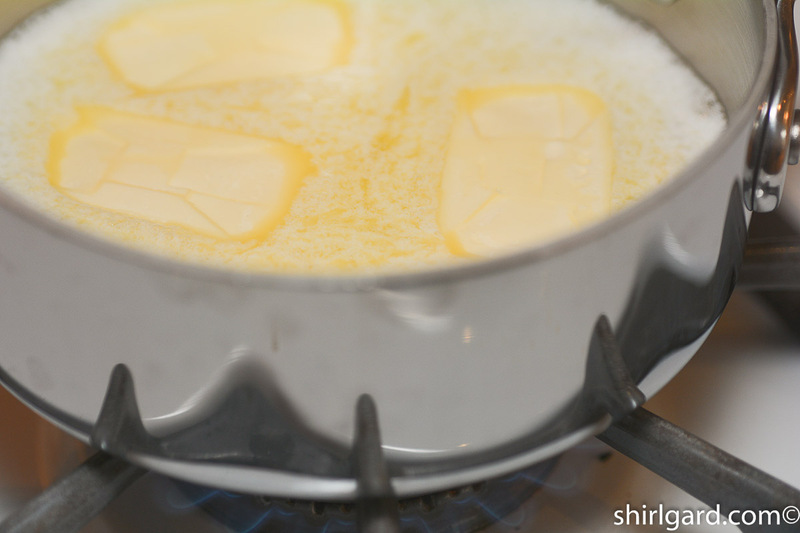 HEAT the butter in a large 12" skillet on medium-high heat until sizzling and just starting to brown. 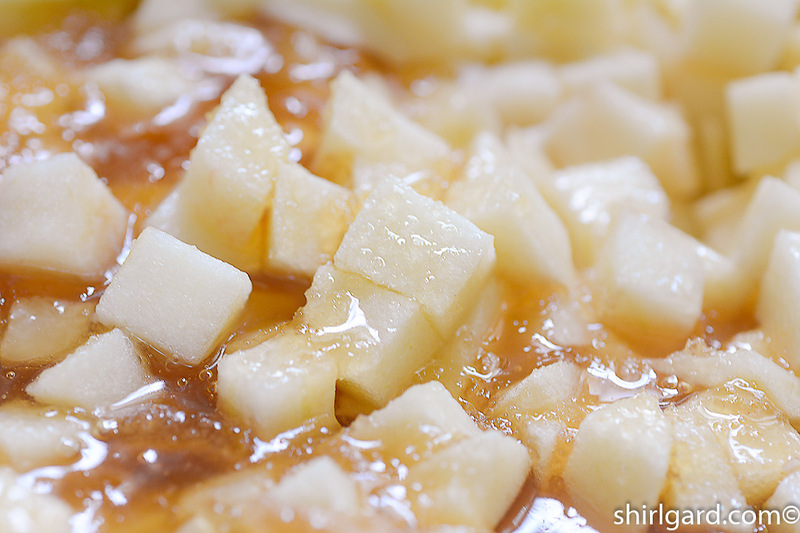 WHISK together the sugar and Instant ClearJel and stir into apples. 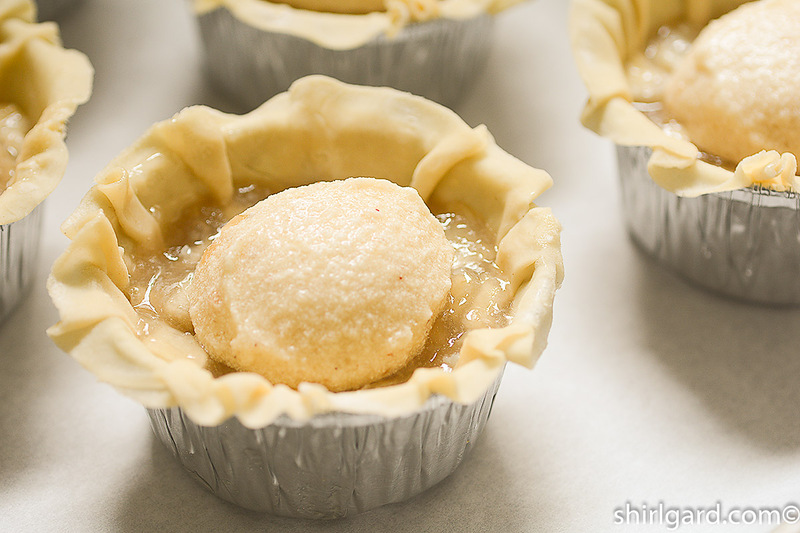 TO BAKE THE FILLING AS AN ALTERNATIVE METHOD OF COOKING: Combine the apple chunks with honey, melted butter, and Calvados. 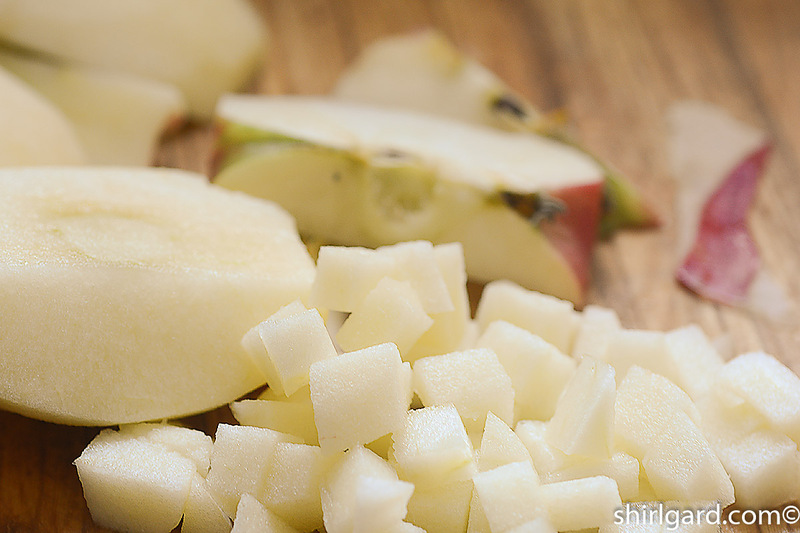 Whisk sugar and Instant ClearJel together and then mix into apples. 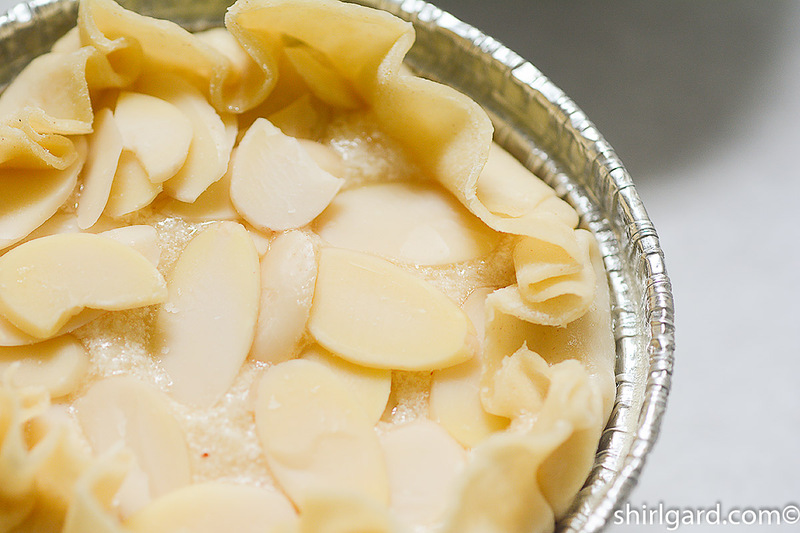 BAKE uncovered @ 350°F (176°C) in a foil-lined quarter or half sheet pan for about 35 minutes, until tender. 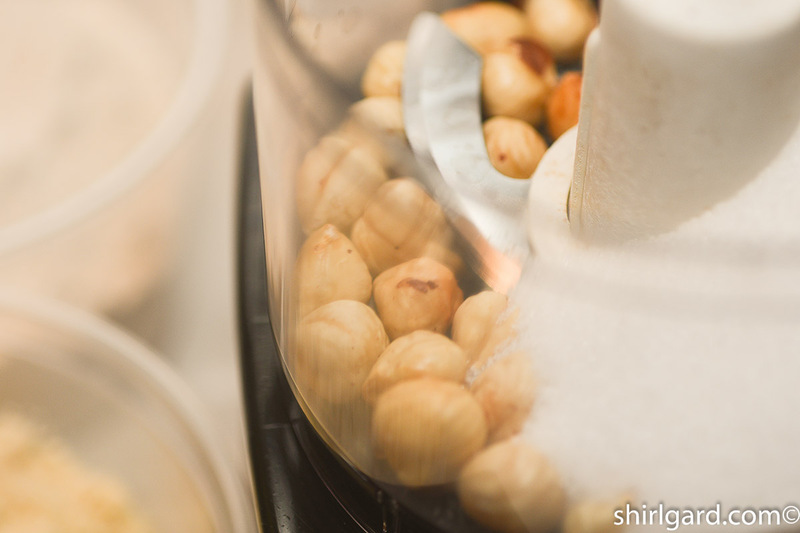 TRANSFER filling to a bowl and cool to room temperature. USE right away or refrigerate for up to one week, if making ahead. 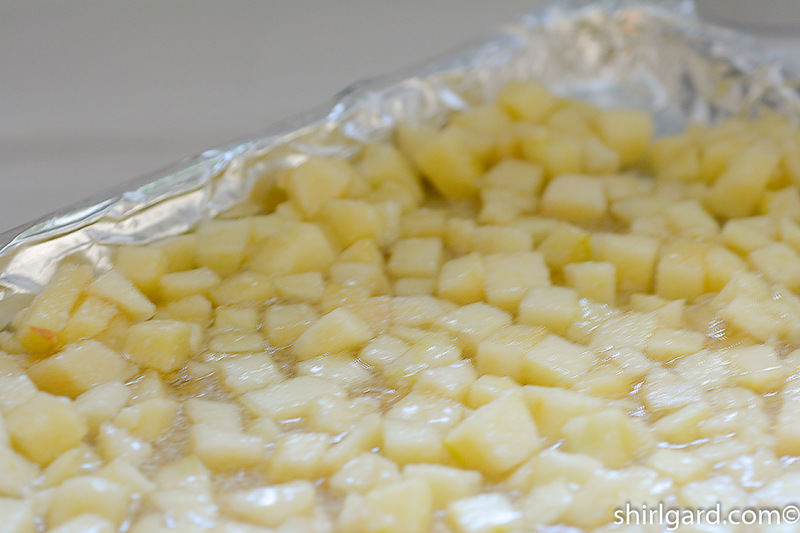 PREP PANS: Arrange 10 4-ounce aluminum pans on a parchment-lined half sheet pan. Spray with Pam (with flour). 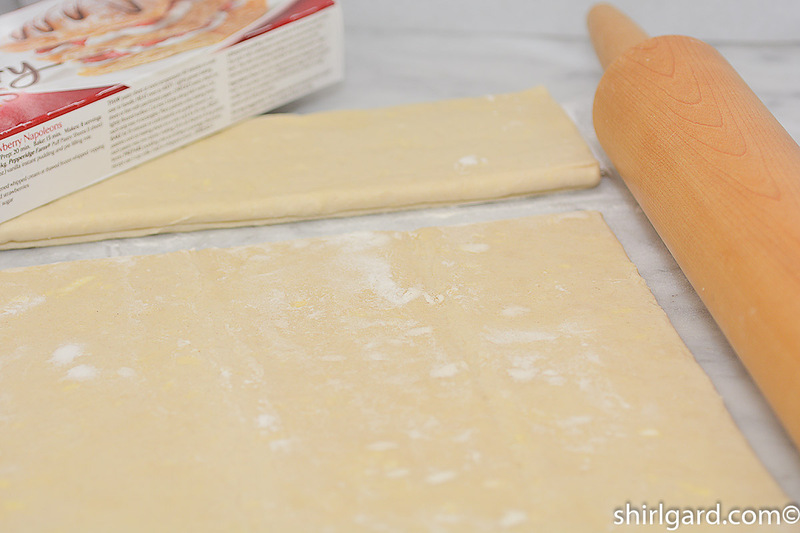 PREP THE PUFF PASTRY: ROLL out the sheets of thawed puff pastry on floured counter. Roll each sheet to an 18" X 18" square. 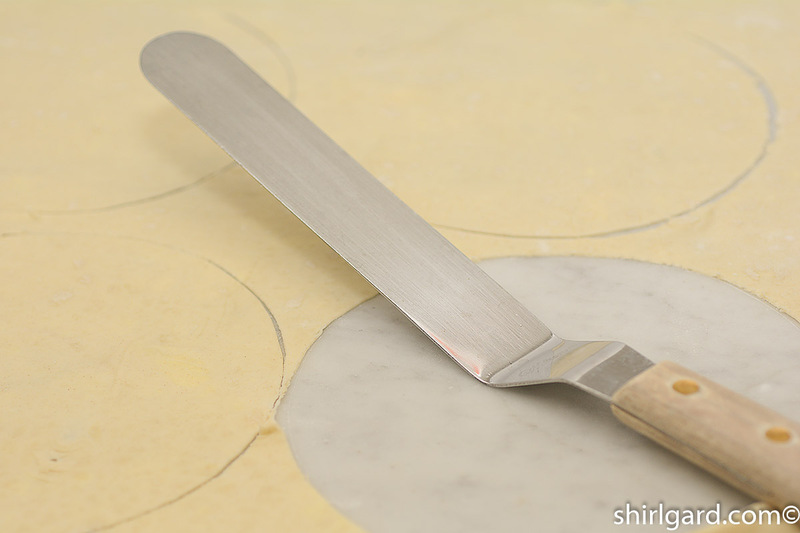 The pastry will be very thin. 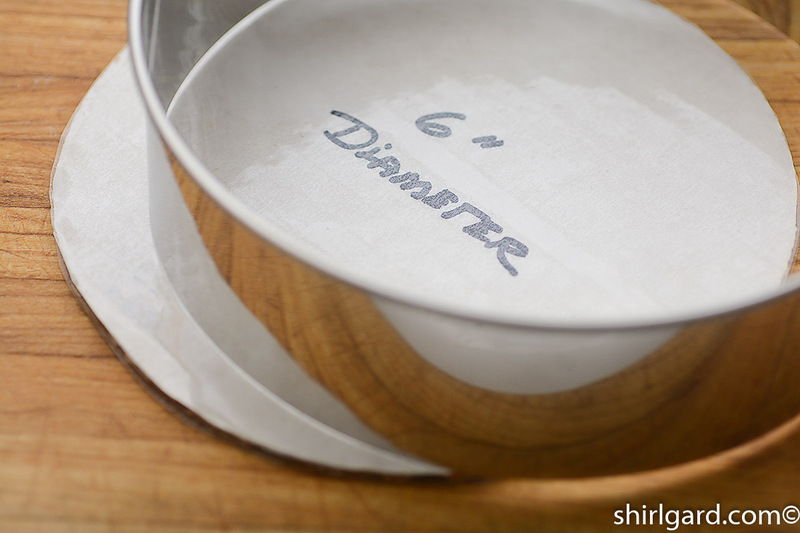 From each sheet, cut out nine 6" diameter rounds using a 6" cutter, or make a template from a cake board and cut out the rounds using a sharp paring knife. 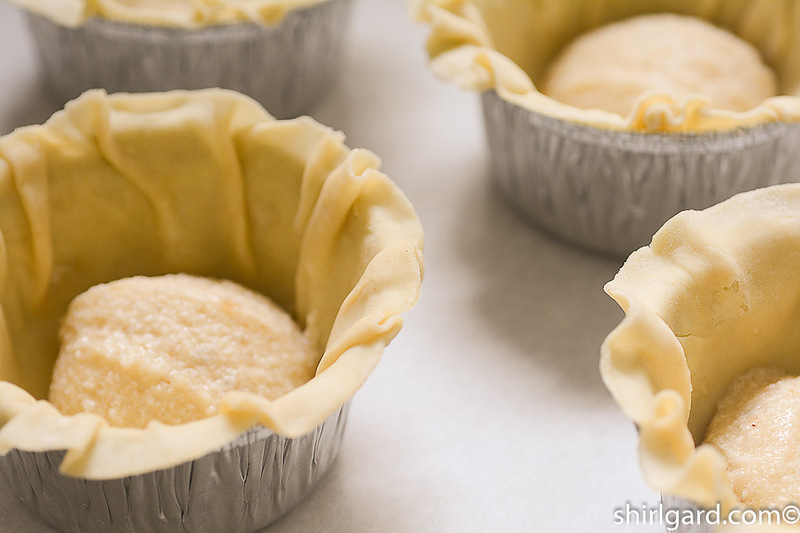 STACK the puff pastry rounds between sheets of plastic wrap and refrigerate at least an hour before filling the pans. 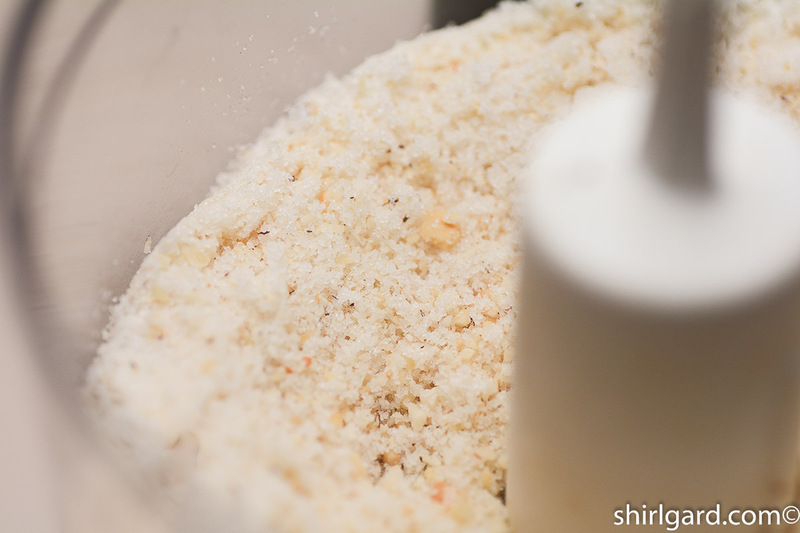 Or, the sheets of dough can be frozen at this point, for up to a month, if you want to make ahead. 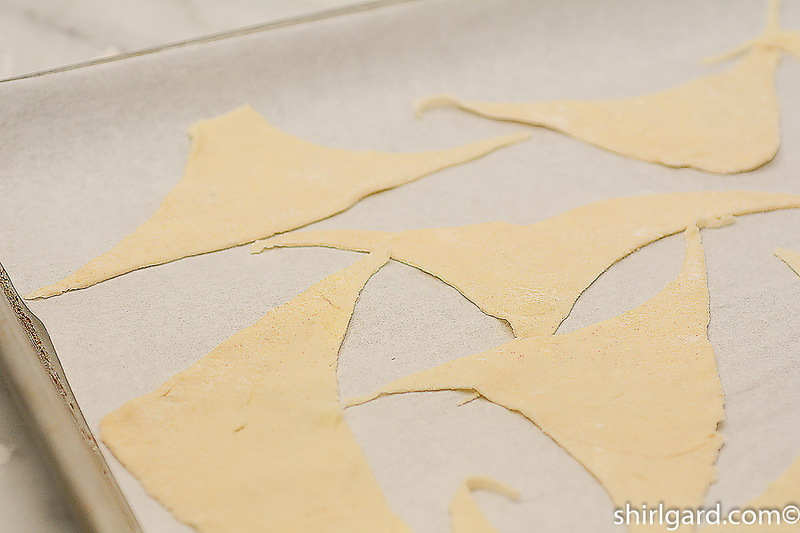 LINE THE PANS: FIT the chilled 6" rounds of thin puff pastry into the pans, pleating the top edges in order to ease in the dough, and allowing the excess dough hang over the edges of the pans. PRE-HEAT THE OVEN TO 425°F (218° C). TO ASSEMBLE FINANCIERS: THREE LAYERS PER PAN - For the first layer, scoop Financier Batter into the bottom of each pan, using a # 40 Purple Scoop (25 grams). 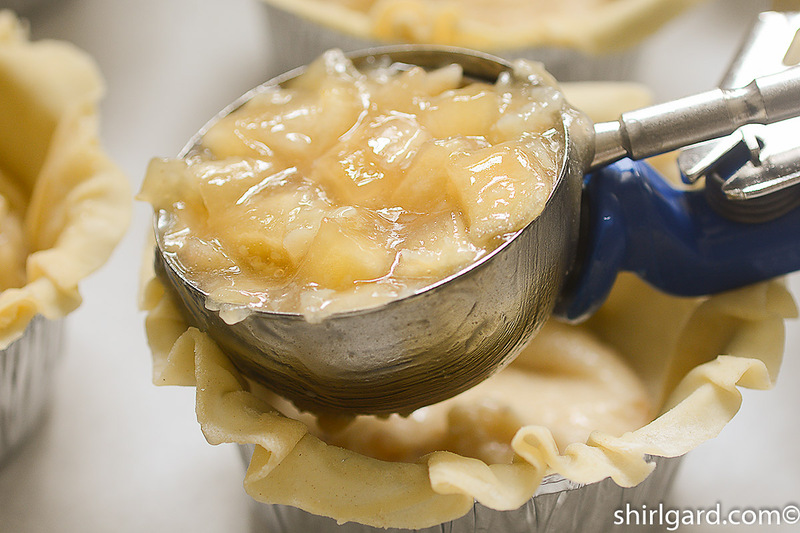 For the second layer, add a scoop of Chunky Apple Filling to each pan, using a #16 Blue Scoop (75 grams). For the third layer, place another #40 Purple Scoop (25 grams) of Financier Batter on top of the apple filling in each pan. 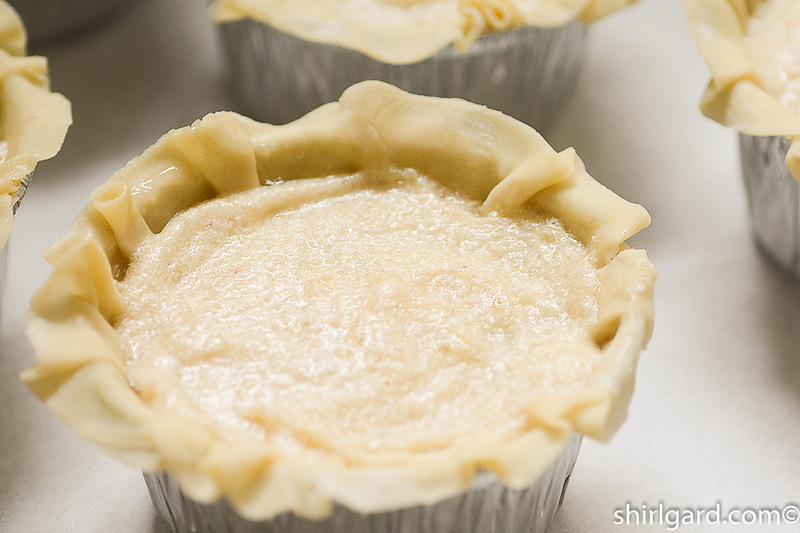 Spread each layer with the back of a spoon or small offset spatula until level. 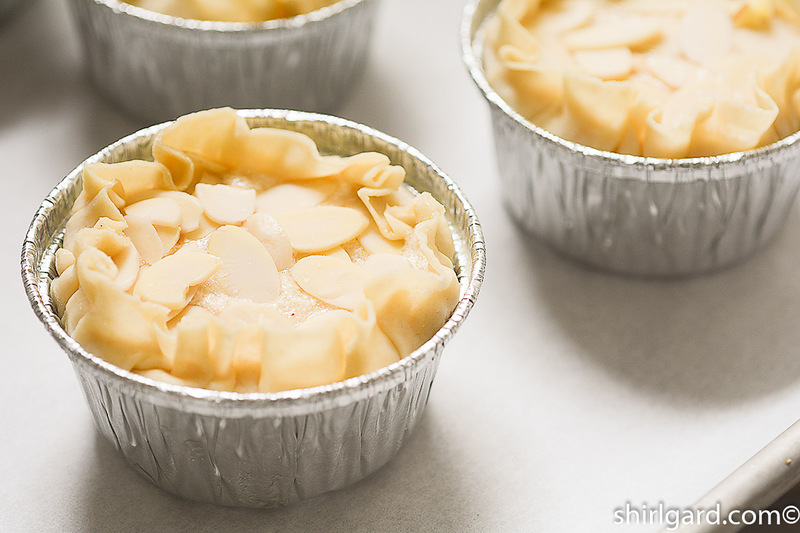 SPRINKLE the sliced blanched almonds on top of the cakes and fold the overhanging dough inward toward the center creating a ruffled edge. BAKE 10 minutes at 425°F (218° C). Turn oven down to 400°F (204° C) and bake another 10 minutes. 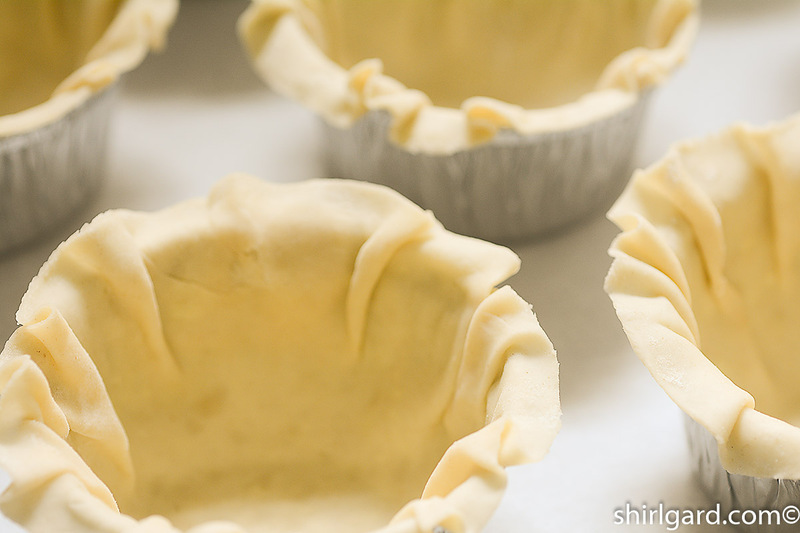 Rotate pan and bake 4 to 5 minutes more, until the tops and the crusts are both golden brown. 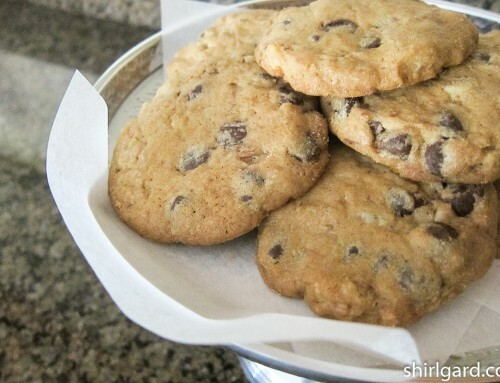 Total baking time 24-25 minutes. 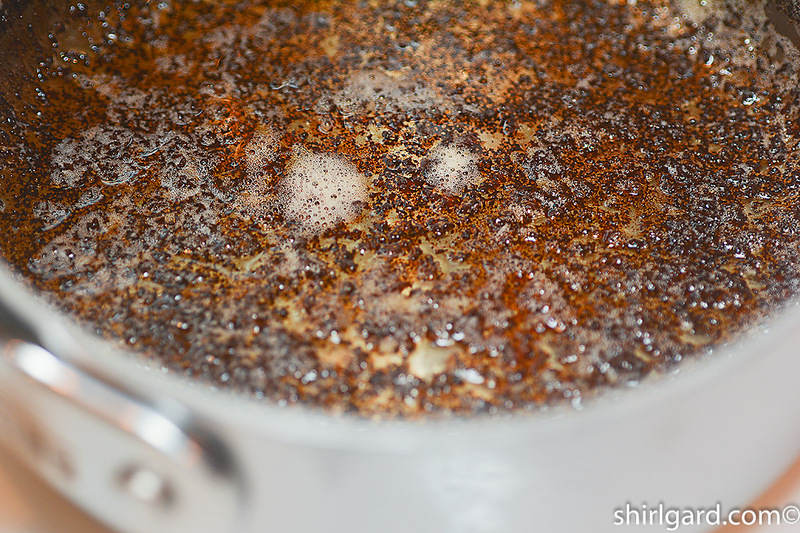 COOL in the pans 10-15 minutes before removing. 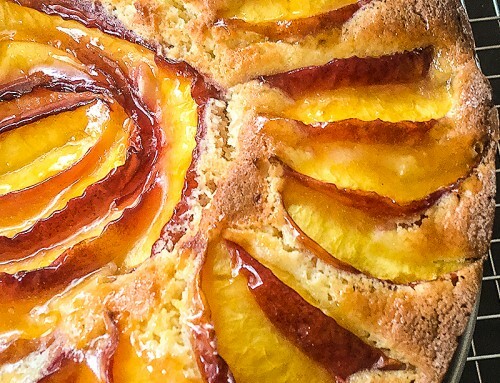 TO MAKE AHEAD: These cakes freeze well. If you want to make ahead, freeze in the pans placed in a plastic bag.